Another trip from Rajgir is to Nalanda. This small village and its surrounding area have numerous associations with the Buddha and his disciples. Sailo 3 kilometres south-west of Nalanda ruins is where the Buddha met and converted Maha Kassapa, the man who was later to become his successor. A large statue of Kassapa with an inscription on it was found in the village in the early 1900's but unfortunately its whereabouts is now unknown. The village of Kul some 1.5 kilometres south-east of Nalanda district is the Kolita of old and the birthplace of Moggalana, the second of the Buddha's two chief disciples. Nalanda in Bihar itself was often visited by the Buddha during his numerous sojourns through Magadha and he taught several important discourses there. In about the 5th century B.C. a monastic Nalanda university was established that was eventually to develop into the greatest ancient centre of Buddhist learning. Students from China and Korea, Sri Lanka and Indonesia and from all the regions of India came to Nalanda monastery to study. When Hiuen Tsiang was studying at Nalanda in the 7th century there were 1510 teachers and 8500 students. The Tibetan pilgrim Dharmasvamin was here in 1234 and has left an a gripping account of the monastery's destruction by the Muslims. Established in the 5th century B.C., Nalanda institute is recorded as the world's earliest university. Buddha is believed to have visited Nalanda vishwavidyalaya a number of times. His favourite disciple, Sariputra was born here and he died preaching at this place. In the 3rd century B.C., Mauryan Emperor Ashoka honoured the famous monk with a grand stupa. Gradually, it became associated with the monks and scholars gathered here for discourses and by 5th century B.C. it acquired the position of a well established monastery under the Guptas. Since the time of Buddha, the bhikkus were always encouraged to study the various arts and sciences. Learning was greatly encouraged as served dual proposes: knowledge and practice. The monks, therefore took to learning so that they might practice it and realise Dhamma perfectly and thereby enrich the masses. The old an incapable were suggested to attach more importance to the practice of meditation. Buddha is believed to have said that if a man live in a Sangha for a few days only and observe the percepts described in the Patimokha, his life would be more precious than his previous one. A long succession of kings from 5th to 12th century extended their royal patronage to ensure the progress and prosperity of the university. A copper plate inscription tells us about the erection of a monastery by the king of Sumatra and records and grant of five villages by the Pala Kings for the maintenance of the monastery at the request of the foreign king. 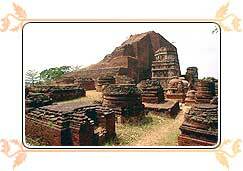 Nalanda during its hey days was a flourishing residential university with over 10,000 students and 1500 teachers. The university was marked by a lofty wall and one gate. Hiuen Tsang, the Chinese pilgrim spent three years at Nalanda. He has left a detailed note about the university, its curriculum, activities and other accounts. He describes about the tall Sangharana buildings which were 3 to 6 storeys high. One of them was capped with a 80 ft. high copper image of Buddha. Another Chinese pilgrim was I-Tsing, who spent 10 years at this university and attests for 8 monastic buildings and over 300 apartments. Nalanda today is in ruins but still it imparts the scholarly look. The archaeological zone here is classified into a number of sites that include 11 monasteries and several temples built in red bricks. Nava Nalanda Mahavihara is devoted to study and research in Pali Literature and Buddhism. This is a new institute, where students from foreign countries also study. In between Nalanda - Rajgir, there is a village namely Silao, where a very popular local sweet "Khaja" is prepared. The lake with its temple to Surya, the Sun god, is a pilgrim destination twice a year in 'Vaishakha' (April-May) and in "Kartika" (October-November), during the Chhath Puja or sun Worship. The nearest airport is Patna 93 KMs. The nearest railway station on Delhi-Howrah (Calcutta) main line is Bakhtiyarpur 38 Kms. Though the loop line connects nalanda. Nalanda Rajgir is connected by Road to Patna, Gaya, Delhi and Calcutta. For more info Nalanda map will help you.